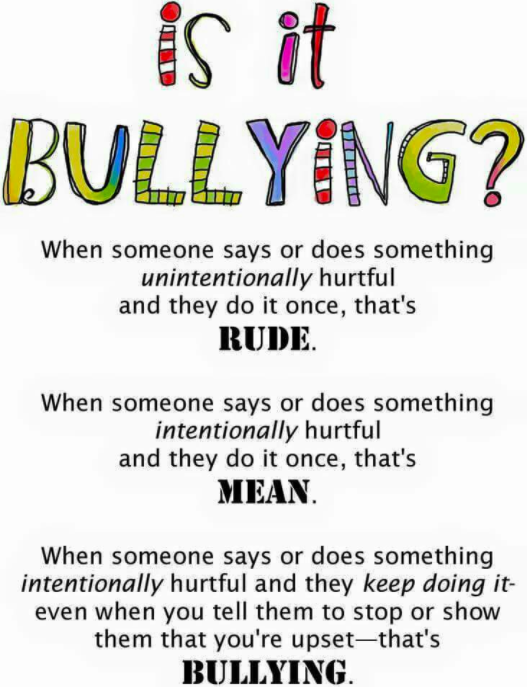 As the Anti-bullying Specialist (ABS) it is my goal to educate our students, parents and staff both on preventing bullying behavior, and how to tell the difference between bullying and conflict. I hope to provide a culture where kids feel safe and supported while simultaneously allowing them to feel that mistakes are made for learning from them- not to be punished for them. The Anti-bullying legislation was created for a reason: to protect our kids and make school a safe and fun place for all! It's our responsibility as parents/guardians, educators, community members, etc. to utilize these laws in a meaningful and reasonable way. *Students are able to report bullying anonymously, at any time, via Mrs. Cicchino's confidential and locked mailbox outside of her office. Beginning in September 2011, new legislation and new anti-bullying guidelines were put in place in the Roxbury Schools and across the state. Staff members were trained on the new law, and professional development continues each new school year. Here is the link to the district page detailing important information and including the necessary forms.